The Best Coffee Shops in Toronto – or at Least, Our Favourites! Something about coffee shops grounds us. No pun intended. Eric owes his Master’s Degree to one coffee shop in Edinburgh. To this day, there’s a plant with his name on it in the front window – marking the stool he occupied for the better part of a year writing papers and his dissertation. Black Medicine Coffee, I salute you always. As a blogging and adventuring couple on the road, we’ve been productive in multiple countries just working away in coffee shops. Lisa’s typical go-to order is a cappuccino, while Eric is a fan of the flat white. Here in Toronto, it’s no exception. Below you’ll find a short list of some of our favourites and some we’ve been to only once – but that you should check out. We’ve listed the shops in geographical order from West to East – from Liberty Village all the way to the Beaches! This way, you can also plan your coffee stops as you visit the best Toronto tourist attractions! For the newcomers to the city, this distance is over an hour by streetcar so please don’t think you can walk all these! If you want to understand the neighbourhoods of Toronto, check out our guide on where to stay in Toronto. Comes with handy Toronto map! If you do manage to visit all these shops, please tell us! As a reward for completing the “P&P Toronto Caffeine Pub Crawl” and we’ll reward you with a personalized shout-out here in this blog post. Deal? Deal. To make it easy, we’ve provided you with the addresses – Google Maps will be your friend. Without further ado, let’s get drinking coffee! Simit and Chai is actually based on a traditional Turkish cafe. Who knew! With loads of plugs and awesome window high stools facing King Street, it’s a location to sit down and work. Their Simit (street-style bagel straight from Turkey) and sandwiches are really tasty and quite cheap considering the quality. Tea is a focus, but try a Turkish coffee or enjoy your classic order done right. 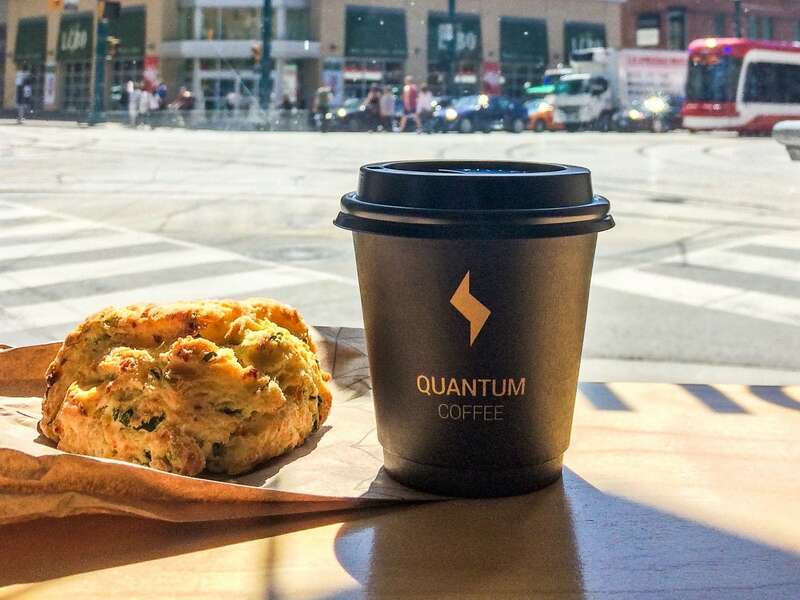 Nothing says Toronto like a Quantum coffee at King & Spadina! Oh, Quantum. You busy beast, you. If you’re looking to drink your beverage in the hustle and bustle of Toronto, Quantum is for you. Located at one of the busiest corners in the city – you can see the CN tower from literally right outside Quantum. Coffee and a view – High five! While seating can be limited because it’s busy, the coffee is good, decently priced, and there’s even a small outside patio area if it’s nice outside. The morning crowd is more of “grab and go” culture, while those sticking around do so to get work done. Quantum smells of productivity – and we love it. Penguin Tip: Try the Spinach and Feta scone. It’s magical. Dineen Coffee can only be described as an elegant coffee place. Want to feel like you’re transported into the 1920s art-deco era? Come to Dineen – cause that’s how we felt. Inside, you’ll be taken aback by huge glass windows that lighten up the space and show you how many little tables and soft benches there are. The coffee was excellent, and while we didn’t try any of the baked goods – they are apparently very good as well. Dineen has a pretty good outdoor seating area if you just need to pull up a high stool and catch up with a friend. Boxcar Social is a cool place. Like, really cool. There are few locations, but we have been to the one on Temperance. Located in the heart of the Financial District, you’ll be met by men and women in suits and fancy clothes – but don’t feel too out of place. Just get your coffee from the friendly staff and enjoy the good vibes. Eric has been quite productive there in the past because they have good wifi. Once, he ate a sandwich but it seems the menu was changed so he can’t actually tell you which one he had. It was a little pricey, but mega tasty. In the evening, they do wines, craft beers, and have a decent whiskey list so stick around after coffee to really enjoy their style. Located at: 70 Temperance Street, but there are 5 other locations scattered around the city. Our stop at Versus was the result of a networking meetup. Inside, you’ll find a very light shop that screams minimalism. The coffee was excellent, and staff was super friendly, and the place was cozy to work at, while open enough to have a conversation and not feel like you were bothering the others around you. Outside, there’s a large patio area for when the weather is great. Overall, they do local teas, Instagrammable latte art, and a variety of “toasties” – toast-based food – that’s sure to fill you up as a snack. We discovered Mercury Espresso Bar almost on accident. We pass through Leslieville every single day heading to and from work. One day in particular, we were walking through and made the stop. We’re glad we did. It’s a small place, very bright and right on Queen Street. The coffee was excellent – they make a point of brewing as socially responsible as possible. Outside, there’s a nice little patio to enjoy your beverage on. Back inside, there’s a bunch of tables and nice high stools for working at against the window. We’d had a long day at work and took the barista’s suggestion to get a matcha lemonade with our flat white. Both were awesome. This industrial garage door entrance seems uninviting – but don’t let that fool you! Inside Te Aro, you’ll find plenty of tables, benches, good drinks, and food for all humans to consume. While it’s a little pricier, it’s definitely a place to catch up with someone – inside the shop, or outside in the sunshine at a little round table. We found the atmosphere is lively and chatty, so unless you’ve got your headphones, diving into some intense work might not be the best here. Or maybe you like chatter to work in? To each their own! Tango Palace is for those of you who like mismatched furniture, little round tables, and Latin American music playing in the background. Tango was filled with other people who had come to get work done. As such, the atmosphere was quieter, but very cozy. The coffee was very well priced and well made. If you want food – they offer a variety of lighter sandwiches and wraps, but dominate the sweets department with a large case you can peer through to see the goodies. We had a Nanaimo Bar the size of your face and it was absolutely amazing. If you’re not Canadian, welcome! A Nanaimo Bar is a chocolate, custard, coconut dessert bar that’s totally Canadian and heaven on earth. Definitely will be back to work/blog in Tango! Bud’s Coffee Bar is a small shop out in the East end serving up decent lattes with minimal seating. It’s more of a “grab and go” kind of place, but that’s its style – and we like it! As always, the window stools are perfect for people watching on Queen Street and getting down to whatever you’re working on. The staff are very friendly, and are typically knowledgeable baristas that know their coffee. It”s a nice stop between all the Starbucks in the area, just sayin’. There you have it. All the coffee places in Toronto. Just kidding. There’s about 1 million more. What are your favourites? Where should we check out next? Toronto community, please let us know. We’re always looking for a new spot to try. We’ll waddle there for coffee, guaranteed! Oh, and let us know if you complete our “Coffee Pub Crawl”.